(MoneyWatch) Richard Cordray's turn before Senate lawmakers today to consider whether he deserves more time as head of the Consumer Financial Protection Bureau was less about his qualifications than about the ongoing fight over how to improve the nation's financial system. That fight flared even before Cordray, who President Barack Obama installed as head of the CFBP by recess appointment in January 2012, had uttered a word. Decrying a pledge by Republicans to block Cordray's nomination unless the bureau is overhauled, Sen. Sherrod Brown, D-Ohio, said in a Senate Banking Committee hearing that GOP "senators are blocking a nominee because they simply don't like the agency that he will lead." 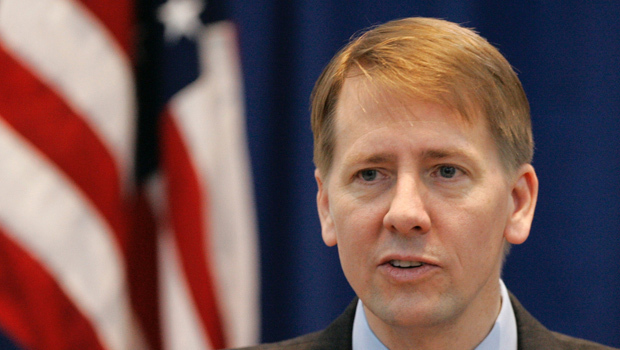 No legislators or financial experts question Cordray's credentials to lead the CFPB. But congressional Republicans have opposed the bureau even before it was created in 2010 under the Dodd-Frank financial reform law, which seeks to protect people from the kind of deceptive financial practices that were rampant in the years leading up to the housing crash. Republicans want to change the structure of the bureau so it is led by a commission, rather than a single director, and for Congress to have control over the CFPB's funding instead of the Federal Reserve, a step they say would make the bureau more publicly accountable. Banking organizations are also calling for the CFPB to be revamped. The Consumer Bankers Association "continues to call for changes to the CFPB structure, including from a sole director to a commission, so it endures the test of time, not just the next election," said Richard Hunt, CEO of the financial industry trade group, in a statement. In the hearing, Cordray said the CFPB is already subject to strong congressional oversight, noting that the bureau must periodically report on its activities to lawmakers and that it is audited by the Government Accountability Office. The CFPB also must answer to a council of other banking and government agencies, which in some cases can override the bureau's authority, while Congress may change its rules. In addition, and in contrast to other financial regulators, the bureau's budget is capped. Consumer advocates say that allowing congressional committees to scrutinize every CFPB decision would subject it to political pressure, undermining its independence. They also point out that other financial regulatory agencies, such as the FDIC and Office of the Comptroller of the Currency, are led by one director instead of a commission. More broadly, such watchdogs praise Cordray's record in leading the CFPB. "Under Cordray's tenure, the CFPB enforcement actions have resulted in $425 million of refunds to approximately 6 million consumers who were subject to deceptive financial practices," said Pamela Banks, senior bank counsel for Consumers Union, the advocacy arm of Consumer Reports, in a recent letter to the Senate endorsing Cordray. "The CFPB has also helped resolve over 133,000 financial services complaints involving a wide variety of financial issues including credit cards, mortgages, student loans and bank account services." Sen. Pat Toomey, R-Pa., and other Republican members of the Senate panel on Tuesday pressed Cordray on how the CFPB spends money and questioned if the bureau is using its budget wisely. In response, Cordray said that the new agency had had to deploy part of its funding to creating the bureau, which didn't formally exist until opening its doors in 2011. Sen. Elizabeth Warren, D-Mass., who is credited with conceiving the idea for the CFPB and who was favored by many to become the bureau's first director, attacked the idea of subjecting the agency's budget to the political push and pull of congressional appropriations. "I want to know why every banking regulator since the Civil War has been funded outside the appropriations process, but unlike with this consumer agency no one in the United States Senate has held up confirmation of their directors, demanding that... those agencies be redesigned," the Massachusetts Democrat said. "From the way I see how other agencies are treated, I see nothing here but a filibuster threat against Director Cordray as an attempt to weaken the consumer agency," she added. Such points aren't merely academic. How government regulators are funded is critical to their ability to oversee industry and carry out their consumer protection duties. And in the contentious debate in Washington over financial reform that followed the 2008 financial crisis, Republicans opposed to stricter regulation have threatened to cut funding for the SEC and Commodity Futures Trading Commission. That has prompted consumer rights groups to warn against giving Congress tighter rein over the CFPB's budget. "We don't need another SEC and CFTC debacle where these agencies don't have enough funding and resources and are constantly attacked by the same companies that caused the financial crisis," said Ed Mierzwinksi, consumer program director at U.S. PIRG, a consumer advocacy group that supports Cordray to head the bureau. Cordray's confirmation as head of the CFPB is far from assured. Republicans could filibuster his nomination, and with 55 seats in the Senate (including independents) Democrats would struggle to overturn it. In February, meanwhile, the U.S. Court of Appeals ruled that three recess appointments -- which take place when Congress is out of session -- to the National Labor Relations Board were invalid. Opponents of the CFPB could use the decision to legally challenge Cordray's appointment, stalling or even scuttling his nomination. At the hearing lawmakers also heard testimony from Mary Jo White, Mr. Obama's nominee to head the SEC.